New Delhi, August 29: On this Independence Day we saw clarification on Rafale Deal due to foolish allegations of the Congress Party. Today Finance Minister Arun Jaitley raised 15 questions in which he asked Congress leader Rahul Gandhi to answer them and also in an interview washed away the stains of allegations. 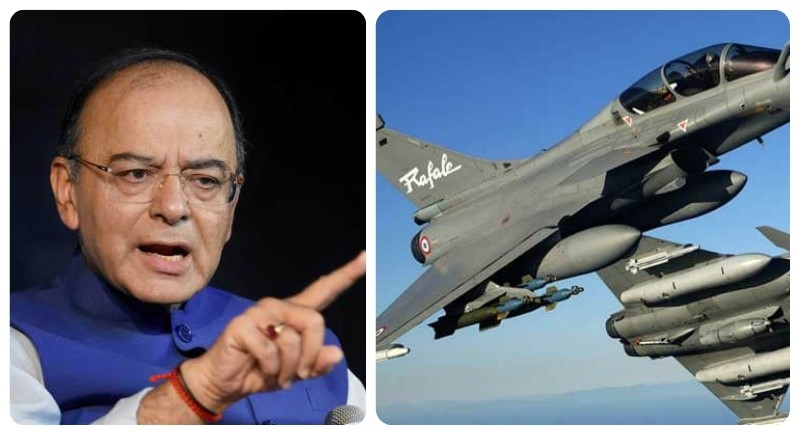 Jaitley said that Rahul Gandhi himself has given seven different prices in different speeches with regard to the Rafale that is the 2007 offer. And the simple case is they have made it as if it is a kindergarten or primary school debate. “The earlier L1 offer was that 18 will be supplied and rest will be manufactured. I am not getting into HAL issue at the moment as there is a retail correspondence on why that did not happen. Probably that was one of the considerations that weighed with the UPA in the abandoned deal because they had serious doubts about manufacturing abilities in India,” says Jaitley. He also said that once this preliminary arrangement is entered, we decided, let us negotiate better terms than 2007. The price negotiation committee of India and France meets for 14 months. The contract negotiation committee goes on for 14 months. Rahul Gandhi and his party aware that the PNC and CNC went on for 14 months and finally produced a contract with terms more favorable than 2007?